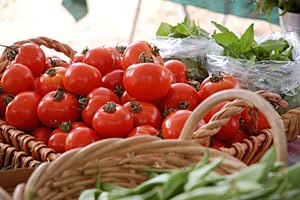 Many tomato varieties will be available. SANTA CRUZ, CA--Just as gourmets appreciate fine wine, gardeners in Santa Cruz seek out unusual varieties of flowers, vegetables, and herbs. At this year's UC Santa Cruz Spring Plant Sale, gardeners will delight in the array of varieties available, including 12 varieties of sunflowers, at least 18 tomato varieties, a dozen peppers, three strawberries, and several raspberries. The sale takes place May 5-6 from 10 a.m. to 2 p.m. in the Barn Theater parking lot at the base of campus, where plenty of free parking is available. Members of the Friends of the Farm & Garden will be admitted at 9 a.m. on Saturday and receive a 10 percent discount on purchases; memberships will be available during the sale. Only cash and check are accepted. All proceeds support the UCSC Apprenticeship in Ecological Horticulture. The range of varieties available this year pays homage to Alan Chadwick, who founded the original UCSC garden in 1967 and was a major force in building gardeners' appreciation of plant varieties. The sale will spotlight a new collection of dazzling blue- and purple-flowering plants that will sparkle in perennial beds and herb gardens, including lavenders, salvias, iris, three different butterfly bushes, herbs, and bedding plants. As always, a full selection of organically grown plants will be available, including a rainbow of flowers: cosmos, zinnias, statice, snapdragons, stock, coneflowers, and more. Vegetables will include tomatillos, Asian greens, cucumbers, summer and winter squash, carving pumpkins and gourds, leeks, scallions, Swiss chard, kale, broccoli, cauliflower, cabbage, lettuce, and salad mix. Herbs such as cilantro, dill, and many basil varieties will also be for sale. "We'll have all the old favorites, but we're excited about this new 'true blue' collection, which marks the beginning of a new Farm & Garden collection that will grow over time," said Christof Bernau, manager of the Farm's garden, who has propagated many of the plants that will be for sale. "These species all prefer well-drained soil and full sun, although many tolerate partial shade. As an added plus, most are deer resistant."
. Provence, a common lavender beloved for its fragrance.
. Silver Frost, another lavender that provides striking contrast in the garden.
. Salvias with blooms that range from true-blue to deep-purple and habits from low-growing spreaders to shrubs.
. Butterfly bushes adored by hummingbirds, including Buddleia lindleyana, which grows 10-12 feet tall with lavender-magenta flowers, and two different cultivars that produce spikes of fragrant soft lavender-blue blooms.
. Blue-flowering annuals include bachelor's button, honeywort, love-in-a-mist, blue flax, starflower, and a noninvasive species of forget-me-not. The Spring Plant Sale is cosponsored by the Center for Agroecology & Sustainable Food Systems and the Friends of the UCSC Farm & Garden. More information is available by calling (831) 459-3240 or visiting casfs.ucsc.edu.